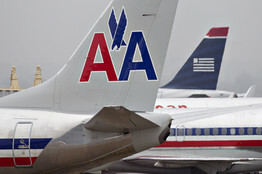 American Airlines parent AMR Corp. and US Airways Group Inc. are hashing out the last major details of a merger agreement that would create the world’s largest airline and are racing to finalize a deal, said people close to the discussions. American Airlines and US Airways are hashing out the last major details of a merger that would create the world’s largest airline and are racing to finalize a deal, said people close to the discussions. WSJ’s Mike Spector reports. Photo: Getty. If the deal is reached, the new company could have a market capitalization of more than $10 billion and would vault ahead of United Continental Holdings Inc. as the biggest U.S. airline by traffic. The all-stock deal would be executed as a reorganization plan that takes American out of Chapter 11 bankruptcy protection. The people cautioned the merger negotiations remained fluid and could fall apart. American has resisted a deal at various points in favor of emerging from bankruptcy protection as an independent airline. Significant points of the deal, including how to split ownership of the airline and how to arrange board seats and management ranks, remain unresolved. The boards of both airlines haven’t yet convened to consider the deal, although American representatives on Wednesday discussed whether to schedule such a meeting, said a person close to the matter. It could take another couple of weeks for an agreement to be completed, the people said. The discussions are now at an advanced stage, with AMR Chief Executive Tom Horton, US Airways CEO Doug Parker, and a small circle of advisers negotiating the merger’s finer points. Under the deal’s current contours, American creditors would own roughly 72% of the airline and US Airways shareholders about 28%, people close to the discussions said. See key events in American Airlines’ history, including its bankruptcy protection, and merger events. Mr. Parker is in line to run the combined airline as CEO, they said. Mr. Horton, meanwhile, could become nonexecutive board chairman for a limited time, though his exact role remained in flux and there were some discussions about him becoming executive chairman—a more powerful position. 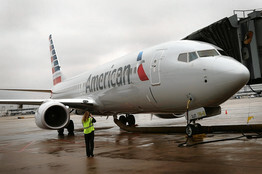 American’s board is interested in Mr. Horton having some kind of role to ensure the merger’s potential financial benefits are realized, one of the people said. Influential creditors controlling American’s fate largely support a merger, making a deal highly likely unless disagreements unexpectedly mushroom, the people said. The airlines and American’s creditors are racing to finish a deal before Feb. 15, when a nondisclosure agreement American’s bondholders have signed expires. Several people close to the matter said it could be difficult to meet that deadline, so the confidentiality agreements might need to be extended. Other outstanding issues that could delay a deal include the exact makeup of the new airline’s board and how creditors with claims against American’s parent and operating subsidiary would be treated in bankruptcy court, they said. 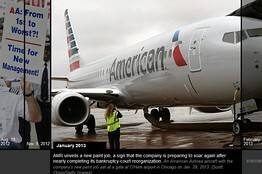 American’s bondholders have decided a merger would enable them to recover more money. And the airline’s unionized pilots, flight attendants, mechanics and ground workers have long lobbied for a marriage, at one point even negotiating secret contracts with US Airways on how they would be treated if the companies joined forces. A combined airline would likely retain the American name and remain based in Fort Worth, Texas. The airlines are hopeful the marriage eventually will generate increased revenues and cost savings. That would mainly come from eliminating duplicative back-office and operational functions, downsizing US Airways’ Tempe, Ariz., headquarters, reducing management ranks, sharing airport gates and jettisoning some aircraft. The two sides have disagreed at various points on the merger’s potential financial benefits. US Airways has said it believes the merger would yield $1.2 billion in additional revenues and cost savings. American has at certain points pegged that number lower, according to people familiar with the company’s views. The combination would represent the final step in a consolidation process that has stabilized the U.S. airline industry by taking seats out of the skies and giving carriers more leeway to raise fares, which are 16% lower than they were in 2000 on an inflation-adjusted basis domestically. The tie-up would leave American-US Airways and three other major carriers dominating the industry in the U.S.—all of which have done their own mergers in the past six years: United Continental, Delta Air Lines Inc., and Southwest Airlines Co.
For decades, U.S. airlines were world leaders in innovation, and while regulated by the government, their fares were set to cover their costs. After Congress deregulated the industry in 1978, that guaranteed profitability went away and carriers began a decadeslong scrap for market share gains, often charging fares so low they didn’t cover costs. The industry has been marked by myriad bankruptcies and failures and only in the past few years have airlines reined in their capacity, taken an ax to their costs and tried to run their businesses more rationally. With fewer, larger carriers, the sector has returned to profit despite the tepid economy and historically high fuel prices. While passengers dislike rising fares, larger carriers also offer bigger route maps, the perks of bigger frequent-flier programs and the ability to invest in customer service, which has been an afterthought in recent years as the industry struggled. The American-US Airways combination “will result in four healthy airlines with the right level of capacity,” said John Thomas, head of the global aviation practice at L.E.K. Consulting. “Four big players is a very successful environment,” he said, adding that it also leaves room for smaller airlines such as Alaska Air Group Inc. and JetBlue Airways Corp. to succeed. A merger agreement would need to clear several other hurdles. They include the approval of the U.S. Bankruptcy Court judge overseeing American’s 14-months-long reorganization and clearance from antitrust regulators at the U.S. Justice Department. Most industry analysts expect the American-US Airways merger to receive approval as the two have slightly fewer overlapping routes than the two most recent merger partners, United-Continental and Southwest-AirTran Airways. The new American would be 2.3% larger than United by capacity, and 2.2% larger by traffic, based on 2012 data. US Airways hubs in Philadelphia, Charlotte and Phoenix would be combined with American hubs in Dallas, Miami, Chicago, New York and Los Angeles. The merger would fulfill Mr. Parker’s multiyear effort to find a partner, and give him a larger canvas. The CEO orchestrated a similar but smaller merger in 2005: combining his America West Airlines with US Airways as it emerged from its second bankruptcy reorganization. That pairing left the new US Airways vulnerable as the nation’s fifth-largest carrier. When AMR became the last big legacy carrier to seek protection from its creditors in late 2011, Mr. Parker pounced and began pushing hard for the merger. He argued that American’s weak East Coast route map would benefit from US Airways’ dense route network there, allowing the two to better compete with United and Delta. But AMR made it clear it preferred to first reorganize in bankruptcy and evaluate any mergers later. American Airlines and US Airways are reportedly nearing agreement on a merger, though nothing is finalized and neither company is commenting.